Books have been written about the Vann House so this museum piece will be brief. As time permits material will be added. Built in 1804, it was inhabitated by the Vann family until 1835. Numerous others have owned the house; still others have rented it. Over the years the property declined to the point the house was used to store hay. In 1951, Dr. J. E. Bradford finally was persuaded to sell the house with the understanding that it would be restored then operated as a museum by the State of Georgia. The dedication ceremony, which attracted 42 descendants of the Vann family, was held on July 27, 1958. 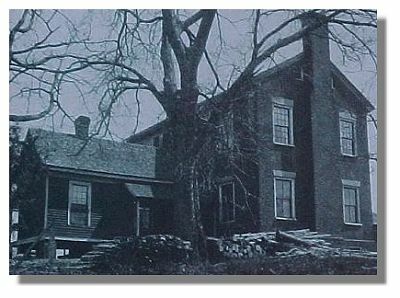 The house was tattered in this south-view photo taken before 1910. The kitchen shown in this 1934 northwest-view was removed during restoration. The cantilevered staircase is one of the house's most unusual features. In 2002 a new visitor's center museum opened at the Vann House. In 2004 Friends of the Vann House spearheaded a successful effort to raise $1.5 million to buy 85 acres just west of the house. Eventually this newly acquired land will display slave cabins, a blacksmith shop, a corn crib, and numerous log structures moved from other locations to be renovated and become part of the historic site. 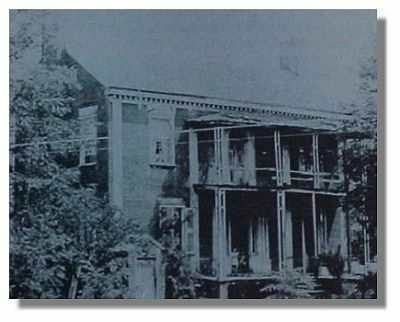 To take a virtual tour of the Vann House, click on the following link. When the new page loads, scroll to end of the text on the first page, then start clicking on the small pictures shown there. Each will enlarge to show detail. When finished with each picture, click the X in the upper right corner of the screen to close the enlarged picture and return to the small pictures for further selection. Every year volunteers decorate the house as they think it could have been decorated 200 years ago, using lots of natural greenery. They light the main house and a slave cabin, as well as the walkways with candles. The candlelight tours are very popular. Ann Varnell of Spring Place shared photos she took in 2009 with the museum. The first half were taken in the main house; the last half in the slave cabin. Tap Specific Image To Enlarge! While touring the house, Ann Varnell took these pictures, which she submitted to the museum. Ann knows she did not get pictures of every quilt in the show but these provide a sense of the show for those who were not able to attend the event. Thank you, Ann! Handmade Friendship Quilt. Donated by a Friend of the Vann House. Crazy Quilt in Fan Pattern. Made by Ada Cordelia Thomas, of Crockett County, Tennessee, circa 1920s. Donated by Mary Mueller, 2010. String Quilt, handmade by Mary Belle Raines, circa 1920. Donated by Mary Mueller, 2010. Unable to read the photographed tag. Maple Leaf, sometimes called Star and Tulip pattern, handmade by Ora Aly of Murray County. Donated in 1990 as part of Georgia Quilt Project by Arminta Swilling and Celia Kinney. Handmade "Fish" pattern. Donated by a Friend of the Vann House. Rolling Star, handmade by Mrs. Langston in 1940s. Donated by Milma Peeples Earnest. Quilted by Vann House Quilters in early 1980s. Crazy Quilt made by Senie McHan Wilbanks, who lived just north of the Vann House in early 1900s. This quilt on loan from Glenda Finley Ellis, daughter of Lorene Vann Finley. It has been passed to the eldest child of the Vann Family since early 1800s. Made by Grandma Vann who lived in the old Vann House, situated across from Plant Hammond, a twin to the Vick house at Alabama-Georgia line. Next picture is a different view of this same quilt. See Glenda Finley Ellis, immediately preceding. Quilt top handmade by Laura Chapman Ballew, circa 1940s. Quilted by Vann House Quilters in 1990s. Donated by Odetta Bramblett Howard. Log Cabin Quilt made by Armanda Elrod Ballew (1848-1927) of Spring Place. On loan from Whitfield-Murray Historical Society, 2014. Handmade Nine-Patch set on a diagonal. Variation of Jacob's Ladder pattern. Red Border. Very fine Quilting. On loan from Nancy Vann Barrett, 1991. A slave at Carter's Quarter made this quilt in early 1800s.